If you’re interested in classic bikes and particularly the unapproachable Norton, on these pages you’ll find plenty to whet your appetite! 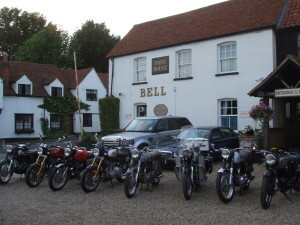 We meet each Month at The Bell, a great biker friendly pub in Woodham Ferrers, about midway between Southend and Chelmsford. We organise rides out, attend local shows and visit local places of interest. Our members can offer a wealth of useful experience to help you with your Norton – old or new! Some of our members are quite keen on long distance rallies both in the UK and overseas. There is something for all enthusiasts. Why not come along to one of our club nights? You don’t have to turn up on your Norton or even on a bike. You can be sure of a warm welcome!